On Saturday 4 August an attempt on the life of President Maduro was made while he was delivering an address to the national guard and civilians on Bolívar Avenue, on the 81st Anniversary of the establishment of the Bolivarian National Guard of Venezuela. Two drones carrying explosives were reportedly shot down near the podium, prompting an evacuation of the President and assembled soldiers. 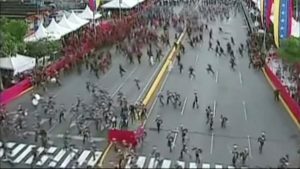 A far-right terrorist group called the “Flannel Soldiers” has claimed responsibility for the attack, a small group apparently linked with several contras who stole a helicopter in June 2017, using it to fire handguns and drop grenades on government buildings in Caracas before escaping. The leader of this gang, Oscar Perez, was killed by Venezuelan security forces in January in a counter-terrorism operation.